At 11:30 on Monday 2 July 2018, coverage of the Wimbledon tennis Championships went live from the All England Lawn Tennis Club (AELTC), produced for the first time by a new host broadcaster. 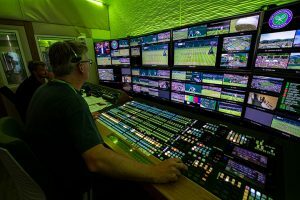 After more than 80 years under the BBC’s expert guidance, the host baton was passed to Wimbledon Broadcast Services (WBS), bringing production of the Championships in-house. 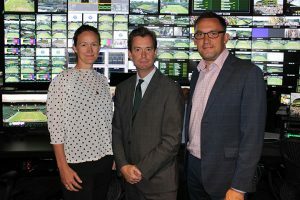 Going live on that Monday was the culmination of two years of planning, preparation and testing: a process that has allowed the AELTC to “take control” of the event coverage and provide international rights holders with a better service as well as add some new twists such as Ultra High Definition (UHD), a Net-cam on both Centre Court and No.1 Court and multi-camera coverage of all 18 courts. A huge undertaking, both logistically and financially, bringing the host broadcast operation in-house also required the construction and installation of a multi-million-pound facility within the Broadcast Centre that is IP-based and includes a UHD and High Dynamic Range (HDR) layer. Aided by technical partner NEP, it was no mean feat. So how did the team behind the move feel on that sunny Monday morning in London SW19 as they waited for the first pictures to go to air? Head of broadcast and production Paul Davies (above, centre) was calm, collected and more concerned with how the International Broadcasters Meeting would go on the Wednesday morning. For Tom Giles (above, right), the broadcast technical manager, however, things were a little less serene. It was the “fear of the unknown” that was creating the tension, he says. As it turns out, he needn’t have worried. That sense of relief was reinforced, and supplemented, by the response from the rights holders, adds Davies. Seeing that the kit all worked and then getting the thumbs up from the overseas rights holders will have gone a long way to justifying the decision to bring things in-house. “It’s definitely been about taking control,” says Davies. The emphasis on quality has been a non-negotiable requirement for everything that Davies and his team have done. Making this happen has required incredible attention to detail, from the design of the graphics to the desire to incorporate UHD and HDR. It has also extended beyond the technical and creative elements and permeated the whole process, right down to matching the colour of flowers in the reception with the Wimbledon brand palette and ensuring that no one pins hand-written lists to control room windows. “We have literally spent two years as a team lifting the lid on every aspect of the broadcast and media operation, working closely across the whole field,” explains Davies. “This has been a massive project. It’s not just been a broadcast project. It started with a vision and how we would deliver that vision with our estates’ team. We looked at how the facility had to work ergonomically as a space and then we started to think in an exciting way about the aesthetics of it and how we wanted it to set the tone in a Wimbledon way. While it is the international broadcasters that have been the focus for many of the changes, AELTC has been very careful not to alienate or adversely impact on the BBC, the UK rights holder for Wimbledon since 1927 – when it was just available on the radio – and the host broadcaster for TV since 1937. The BBC has been able to add UHD-HDR Centre Court coverage to its iPlayer output and it is also streaming coverage from all 18 courts online. The only major change behind-the-camera has been the necessity for the corporation to have two OB providers: NEP and Arena Television. “It was important that the BBC didn’t suffer in any way,” acknowledges broadcast manager Bethan Evans (above, left). “Having two different OB providers – which has never happened before – yet making sure they still had a bespoke service was key. We want their coverage to be as brilliant, if not more brilliant than it has ever been before. That has really taken a lot of communication, talking through workflows. Managing that mix of signals and resolutions was one of the major challenges for WBS and not just for the BBC’s output, as Giles explains. “We had to do a simulcast layer. We’ve got the 1080 50i level, which is the bread and butter and is also how the BBC gets its feeds. The BBC are able to sit across certain parts of our EVS architecture too but, because of the relationships we have with other broadcasters, the feeds also have to be put into the Central Content Store for our archive. With replays for Wimbledon done in 1080p, coverage available in UHD-HDR and the need to have the regular 1080 50i feeds too, money had to be spent. The facility is IP-based, using SMPTE ST 2110-compliant technology. Although the standards weren’t even ratified when AELTC sent out its Request For Proposal (RFP) document in 2017, the benefits are clear. NEP is handling the technical facilities within the Broadcast Centre for WBS. 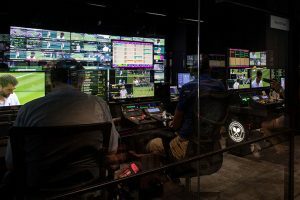 It has installed a distributed routing system, connected by main and back-up MTP fibre optic cable, to serve on and off-site domestic and international broadcasters. In addition, NEP has kitted out 21 control rooms plus three more for the Wimbledon Channel, the World Feed and archive. To support the broadcast, it is deploying more than 118 camera positions and is making use of in excess of 40 EVS servers. The global facilities firm also has three OB units on site (pictured, below). Content within the facility is distributed directly to rights holder MCRs, the Central Content Store, the World feed, the Wimbledon Channel and a transmission, distribution and quality control (QC) area. NEP is also working with Fletcher to provide semi-automated remote multi-camera coverage of seven of the eighteen courts, ensuring that all courts are now covered. In previous years, nine courts were manned and another six automated. The WBS set-up within the Broadcast Centre is run from a huge MCR operation based around two 7508 Arista switches. A completely redundant operation, it took NEP around three weeks to install and should take three days to de-rig. The set-up uses IP technology throughout, although not every single part of the set-up is IP-based, as NEP director of engineering and technology Rob Newton explained to SVG Europe. To pull it all together, a total of 340 Grass Valley IP cards are being used, he says. In 2019, the same set-up will be used for Wimbledon before a lift-and-shift operation takes it to the Rugby World Cup in Japan. 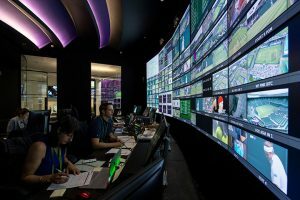 Axon’s Cerebrum is being used to control and monitor the IP workflow while there is also technology installed from Grass Valley, Phabrix, Calrec and Evertz. Suppliers providing services to WBS include MOOV (graphics), Aerial Camera Systems (specialist cameras) and Broadcast RF (wireless camera network). Although simply getting to the 2018 Championships has been a huge undertaking, the WBS team are not looking at this as a finished project. Instead, it is just the start. Giles is keen to push on with HDR and also look at Dolby Atmos for next year while Davies is aware of the need to give rights holders additional options for presentation areas within AELTC. “It is important to get the court coverage right but the presentation of each individual programme is just as key,” says Davies. There is even the possibility that the new WBS facility, originally conceived to be used just once a year, might find further use throughout the sporting calendar. “We’ve had some formal meetings with fairly senior sports rights holders and governing bodies,” reveals Davies. “They are also looking at the facility potentially as a remote production hub. 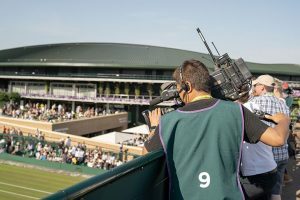 Other production companies have shown an interest in using the edit suites and using Wimbledon as a distribution hub for a world event. It would certainly be a good way to “sweat the assets” and “keep ahead of technologies”, he adds.